So the Jewish leaders began harassing Jesus for breaking the Sabbath rules [by healing on the Sabbath]. 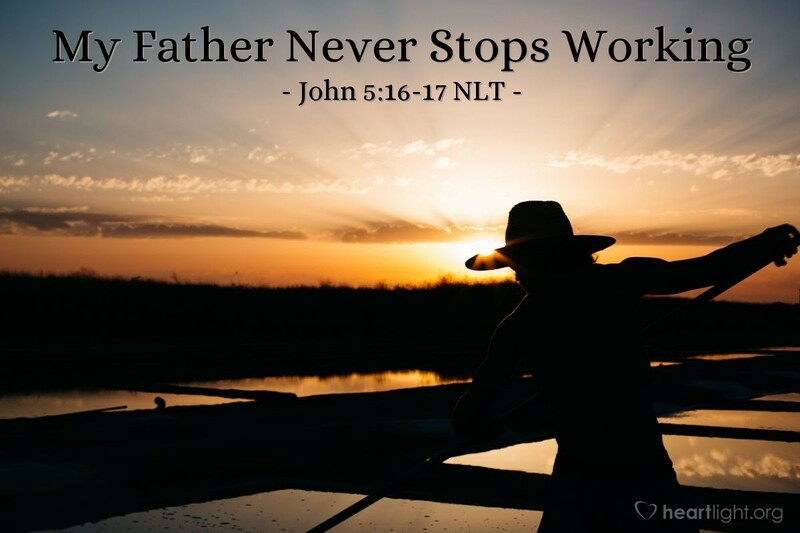 But Jesus replied, "My Father is always working, and so am I." For centuries, the Father in heaven heard prayers, created babies, healed diseases, and upheld the universe on the Sabbath. Why? So his children, his human creations, could be blessed by his rest and honor him. To turn the Sabbath rest into a legalistic debate and forget the people for whom he created it was a sham and a shame. Jesus puts himself in the place of the Father and emphasizes that as long as the Father is working on the Sabbath to do things that bless others, he will too. Jesus' statement is both bold and daring. He is claiming the right to do good on the Sabbath, not just because God wants goodness to be a part of the Sabbath rest, but also because Jesus, like his Father, will not rest nor abandon his human children in their misery. God, I do thank you that when I sleep, you do not. Thank you for working on my concerns, answering my prayers, sustaining my world, and doing your work while I sleep as well as when I'm awake. I cannot comprehend it, but I am truly thankful that you are the God who does not tire or grow weary in doing what is good and what is a blessing. I recognize that all the good things I have in my life have come because of your blessing. I praise you for your mercy and grace that sustain me. In Jesus' name. Amen.